January 25, 2017—–Since Greenland was first settled by arctic people and Europeans, climate has played a huge part in the ups and downs of the human population. The first European colonization took place during a relatively warm period in the Arctic. The global climate during the years 950 AD to 1250 AD is known as the Little Climatic Optimum. Weather was unusually warm for several centuries and human settlements spread toward the Arctic. Iceland and Greenland were settled as were other islands in the North Atlantic Ocean. Eric the Red is believed to have discovered Greenland in 982 AD. In 984 AD, the Norse founded the colony of Osterbygd on the island. Evidence of agriculture and other activities serve to indicate what the climate was like at this time. While it was a cold land, it supported enough vegetation (dwarf willow, birch, bush berries, pasture land) to make settlement possible. The settlers brought cattle and sheep that not only survived but thrived for a considerable period. The Norse established two colonies and began to farm. The outposts thrived and regular communications existed between Greenland and Iceland. Between 1250 AD and 1450 AD climate deteriorated over wide areas around the North Atlantic in what is known as The Little Ice Age. The Little Ice Age was the coldest period in historic times. Areas bordering the North Atlantic Ocean experienced drastic cooling. Mountain glaciers expanded and in some cases reached their maximum extent since the end of the Pleistocene glaciation. Iceland’s population declined. Greenland became isolated from outside contact, with extensive drift ice preventing boats reaching the settlements. Grain that grew there in the tenth century would no longer grow. In Europe storms resulted in the formation of the Zuider Zee, and the excessively wet, damp conditions led to a high incidence of the disease, St. Anthony’s Fire (ergotism). The little ice age marked the end of the Norse settlements in Greenland that had begun in the tenth century. After flourishing for more than 400 years the colonies disappeared about 1410 AD. A Danish archaeological expedition to the sites in 1921 found evidence that deteriorating climate must have played a role in the population’s demise. Excavations show that at first the soil permitted burying bodies at considerable depth. Later graves became progressively shallower. Some graves were in permafrost that had formed since the burial. Tree roots entangled in the coffins showed the graves were not originally in frozen ground. 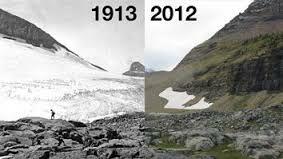 It also showed that the permafrost had moved progressively higher. Examination of skeletons indicated that food was becoming more and more scarce. Most remains were deformed or dwarfed. There was clear evidence of rickets. All the evidence points to a climate that grew progressively cooler, leading eventually to the isolation and extinction of the settlements. It is not certain the colonies failed due to climatic reasons, but it seems likely. By 1516 the settlements had practically been forgotten. In 1540 a voyager reported seeing signs of the settlements, but no signs of life. The settlers had perished. There was no European settlement on the island of Greenland for 200 years. In 1721 Denmark sent an expedition to the island to form an outpost, starting the Greenland resettlement. In recent centuries the climate of the Arctic basin has warmed a great deal. The average temperature over land in the Arctic for the year ending in September 2015 reached the highest since recording began in 1900. The temperature was 2.3 degrees F above the mean for the last 114 years . The year 2016 was the warmest year globally since records began in 1880. The average temperature for 2016 was 58.69 ºF. Temperatures on Greenland followed suit. In June at Nuuk, the capitol city, the temperature reached 75º F (24º C). As temperatures continued to warm the population of the island has been growing. The current population is now above 55,000. Many small settlements have sprung up and agriculture is returning. Until recent years fishing was the primary industry, but now tourism is a growing source of income. Unemployment is relatively high, but with increasing temperatures and more varied employment sources the population is expected to continue to grow. Human settlement in Greenland has been dictated by a changing climate! Categories: Climate Change, Disappearing Ice Shelves, Extreme weather | Tags: #climatechange, #globalwarming, Greenland | Permalink. 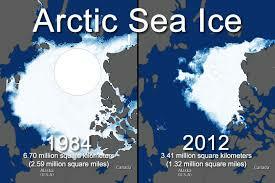 Wow, a lot less ice with the climate changes.